as our lives get busier, prioritizing self-care becomes increasingly important. it’s not just yoga, a day at the spa or even spending quality time with friends. while these are all great ways to relax, there is much more to it! the concept of self-care is about empowering individuals, families and communities to practice healthy habits, prevent disease and cope with illness or disability to achieve optimum health. taking better care of ourselves by utilizing the products available to us not only helps Canadians lead healthier lives, it also alleviates strain on our healthcare system. making a commitment to practice self-care has so many benefits. that’s why Bayer, a global health products leader, is working to educate consumers on how better self-care for a better life can make a difference in quality of life, while improving healthcare sustainability. have you ever heard of the mental health table? it goes something like this: a table has four legs – physical activity, nutrition, sleep, and connection – if any of the legs is broken, your table will be wobbly. when it comes to physical activity, lately i’ve been boxing, doing barre and getting out to hike in the rockies whenever i can. 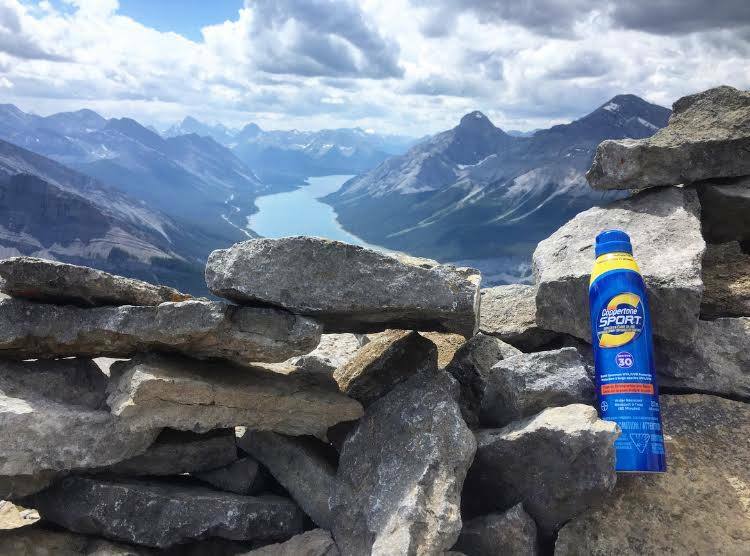 when i’m in the mountains, you’ll always find a can of Coppertone Sport Clear Continuous Spray Sunscreen in my backpack. taking care of your skin – protecting it from UVA and UBA rays – is incredibly important for longterm health. the water-resistant nature of it makes it perfect for sweaty hikes, or if i decided to jump in the lake at the end of a hike on a particularly hot day. nutrition can be a tricky one to keep on track. busy lives rarely leave space in your day for time in the kitchen. add in how delicious food is, and the easy access to all of it through delivery apps, scheduling the time to cook must be prioritized! focus on whole foods, especially vegetables, and you’ll be on the right track. keep a lot of colour on your plate and water in your glass. sleep is always something i’ve prioritized. i’ve never been one to stay up all night; instead, you’ll find me happily tucked in at 10 p.m., ready to get my full eight hours of sleep. if i happen to go a few days without adequate Zzzz’s, everyone can tell. i’m sleepy and grumpy – the worst of the seven dwarfs. if i really need a hand falling asleep, especially if i’m not sleeping well because of a headache or body aches and pains, i reach for Aleve Nighttime. how do you fulfil connection in your life? it can be with friends, higher beings, or yourself. i love one-on-one friendship time where i can have great conversations; that type of bond really fills me up. as an introverted extrovert, big group settings overwhelm me and cause me some anxiety. instead, give me one or two friends, a warm beverage and hours of uninterrupted chatting. my quality of life is always better when i am actively taking care of all table legs. 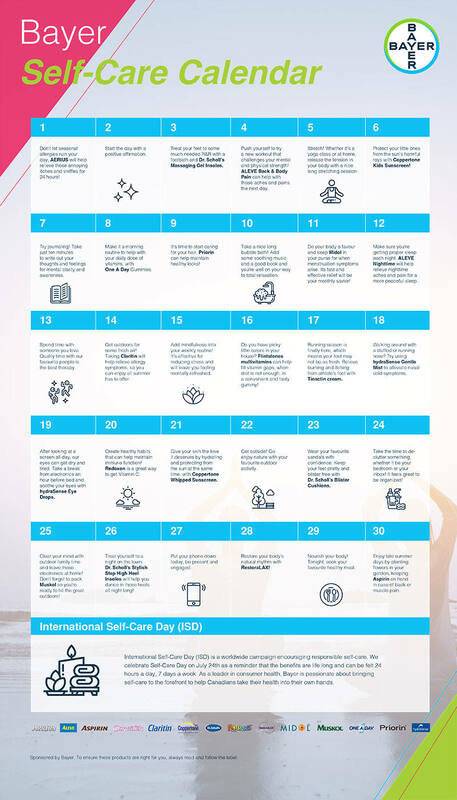 in support of International Self-Care Day on July 24, i challenge you to share your self-care practices with me. to help get you started, Bayer has created a self-care calendar with one tip for each day of the month. 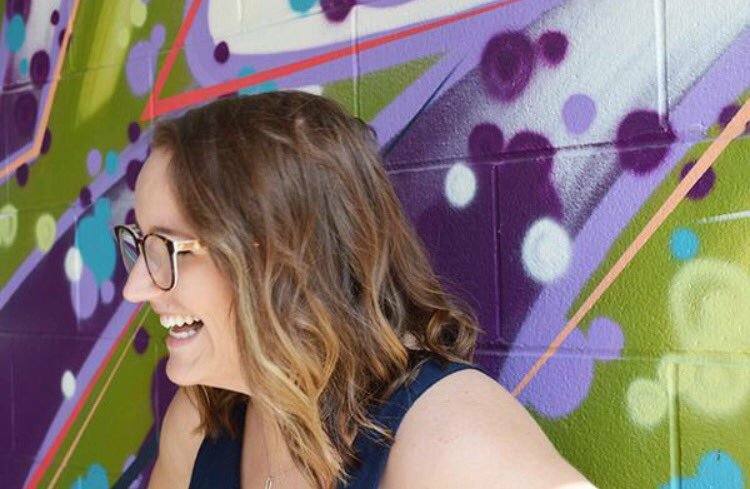 i’ve teamed up with Bayer to give away ten $15 Amazon gift cards so you can purchase your favourite self-care products! in celebration of Self-Care Day, Bayer is running a ‘buy 3 for $10’ promotion through Amazon.ca on most of their brands at https://www.amazon.ca/adlp/bayercanada. want one? of course you do! to enter, all you have to do is share how you practice self-care, tag @laurabridgman and use #SelfCareDay for your chance to win! head over to twitter or instagram (timeline or stories) to enter – don’t have those? leave a comment below. winners will be selected on july 30. open to canadian residents, excluding Quebec. the ultimate day trip to banff. Next Post oh hello, august.